52 Ancestors, No. 1: Russell Hawkins | Photo Restorations by Tim G.
I’m going to try out the 52 Ancestor Challenge, of which I first caught wind from my inspirations at NoStoryTooSmall.com. I’d like to attempt a restoration for each entry. I may not actually have that many damaged photos of ancestors to restore, and I won’t wreck photos just to fix ’em, so many entries may just have cool stories. It should be fun either way. Let’s get started. I can’t think of a better way to ring in the new year then with the rags-to-riches story of Russell Hawkins, who was my first cousin, four times removed. Specifically, he was the nephew of my paternal grandmother’s great-grandfather. Russell’s mother, Elizabeth Attwood Hawkins, was born in England, and she arrived in America at the age of 13 with her parents, Joseph and Sarah Attwood, on August 29th, 1855. Joseph and Sarah Attwood brought their four daughters with them to America. Elizabeth was the oldest daughter. I’ve descended from Harriet, their second daughter. The Attwoods lived briefly in New Jersey, but settled in Philadelphia Pennsylvania, where I still live and work. Elizabeth married one Dennis Hawkins, a photographer and disabled Civil War veteran from Syracuse, New York, on March 19th 1868. 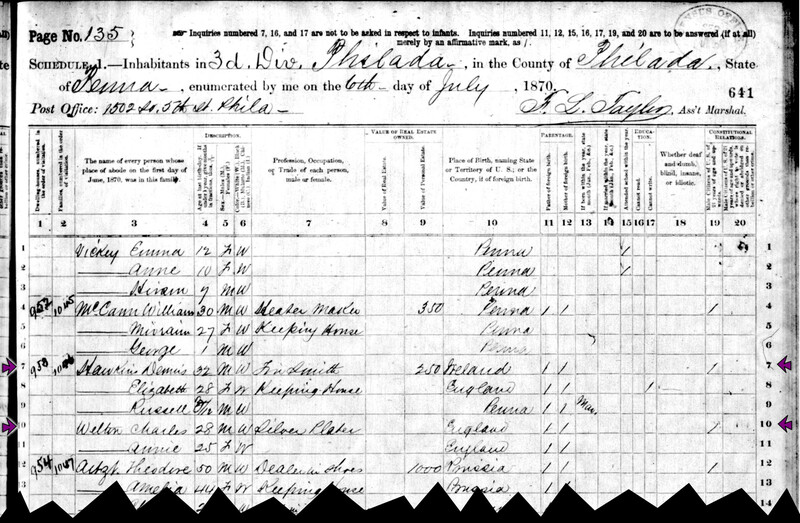 Elizabeth gave birth to baby Russell on March 18, 1870, and the family appears in the 1870 census, living with Elizabeth’s younger sister, Annie, and her husband, Charles. The future looked bright for this young family, but that would change throughout the ’70s, for reasons that were unclear to me at first. 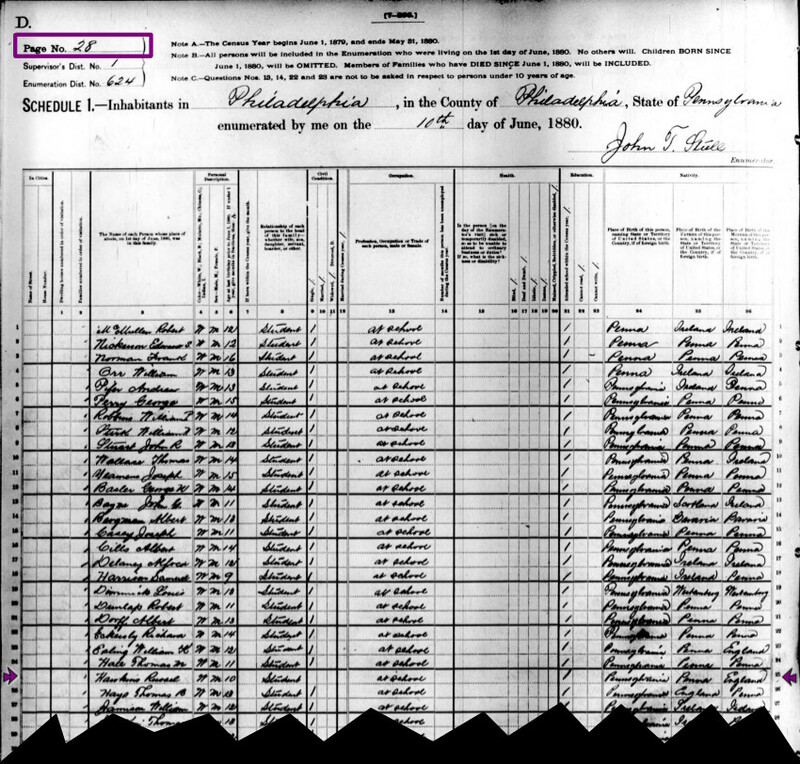 Dennis Hawkins disappeared from the Philadelphia City Directory before 1874. By 1880, Elizabeth was on her own, apparently living in the same building as an unrelated grocer. Young Russell, now at age 10, was by then a student at Philadelphia’s Girard College for orphan boys. For quite some time, this was the last I had heard of young Russell. His mother appeared in later Philadelphia City Directories as the widow of Dennis, but Dennis’s death certificate was not on file with the Philadelphia City Archives. Elizabeth died herself on September 10, 1909 at the age of 67. Although her death certificate and newspaper death notice both identify her place of burial as Fernwood Cemetery, just west of Philadelphia, cemetery staff were unable to find a record of her burial there. Elizabeth’s mother, Sarah Attwood, and sisters, Harriet Harrison and Ellen Berry, are buried at Fernwood with their families, but none of the Hawkins are with them. Elizabeth’s final resting place remains a mystery to me to this day. This was the first I had heard from Russell Hawkins since 1880, when he was listed as a resident of Girard College. 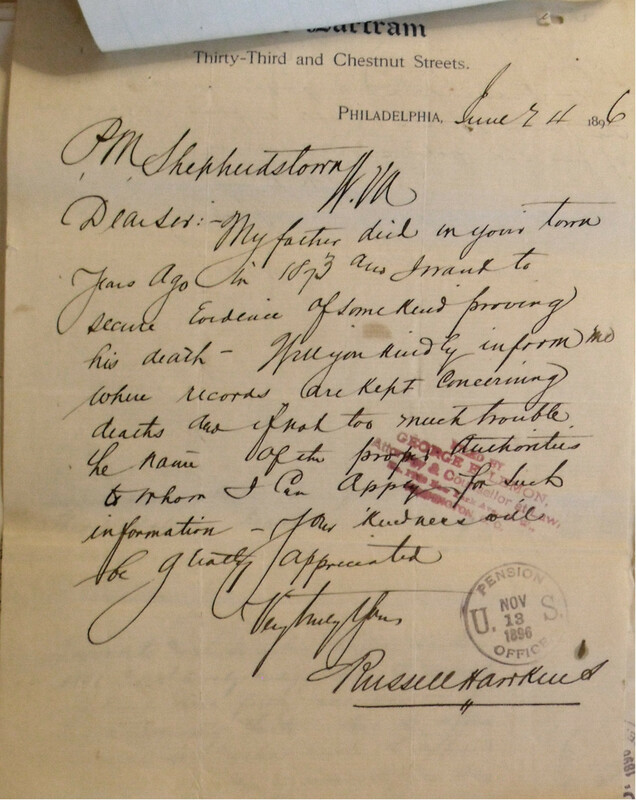 He had written this letter, presumably to the Police Magistrate (“PM”) of Shepherdstown, inquiring where he might find a record of his father’s death. The magistrate wrote back that the town did not keep death records in 1873, but that Russell might inquire with the editor of the Sheperdstown Independent, a local newspaper there. John Zittle, the editor of that publication, responded with a transcription of Dennis Hawkins’s obituary from his office’s records, and with this evidence, Elizabeth Hawkins was awarded her Widow’s Pension. The pension file was a family reunion of sorts, with Elizabeth’s sisters, Harriet Harrison and Annie Wetton witnessing Elizabeth’s ‘X’ mark on various documents. Elizabeth was evidently unable to sign her own name. I took interest in the letterhead of the document. Although I did not wish to pull apart the archival documents, anyone with a passing familiarity with historic Philadelphia names should recognize from what is present that the document came from a place called The Bartram, which was located at 33rd and Chestnut Streets, Philadelphia. Google led me to the website of the University of Penn archives, which identified this as a hotel, and a NewsBank newspaper clipping identified Russell Hawkins as its manager. Russell’s success only grew from there. By the end of the 19th century Russell was vice-president of the Diamond Match Company, a position which took him around the world, to several South American countries, and later to Japan, where he assisted the Japanese government in organizing its match industry. On August 9th, 1902, Russel married Helen Smyser; their marriage license is on file at Allen County, Indiana. They moved to New York, where Helen gave birth to a daughter, Margaret, and a son, Russell, Junior. Upon leaving the Diamond Match Company in 1907, Russell moved with his family to Portland, Oregon, and later to Tillamook, where Russell was a founder of the Whitney Lumber Company, at which Russell Hawkins employed himself into the early 1930s. Russell’s work frequently brought him to Washington, D.C., where he became known among politicians. In June of 1933, President Franklin D. Roosevelt appointed Russell Hawkins a member of the Federal Home Loan Bank Board. 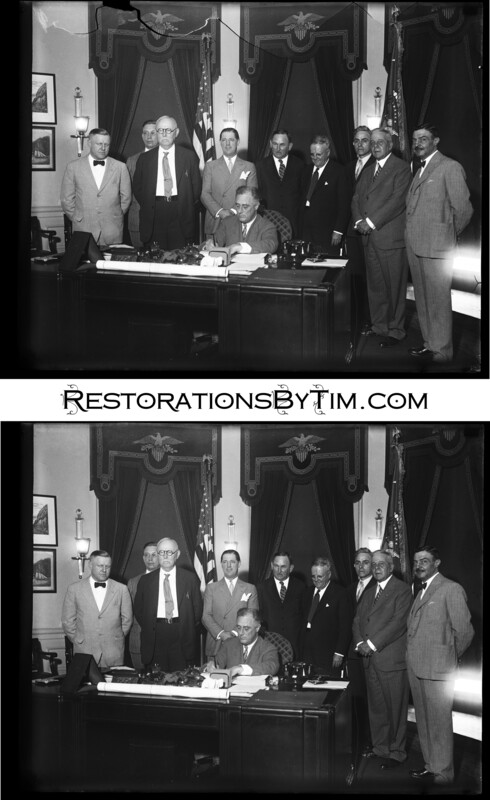 The board is pictured above, standing beside President Franklin D. Roosevelt, as he signed the Federal Home Loan Bank Act into law. The Library of Congress reproduced the image from its original glass negative, and made it available on its web site. The original was evidently damaged. Some cracking has appeared at the top of the image, which I have repaired. Although the Library of Congress site lists all subjects of the photographs, their names are not in their correct order. Corbis Images hosts an alternate snapshot of the above scene, and identifies Russell Hawkins as standing at far right. 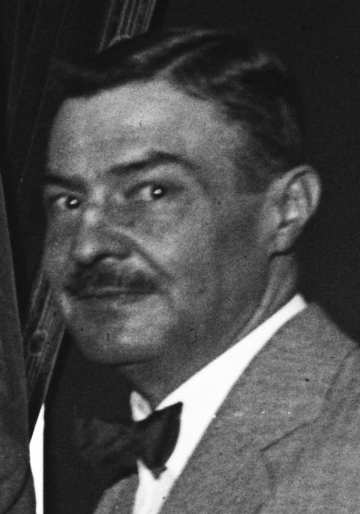 Russell Hawkins contributed to the board’s first annual report, which covered the Board’s activities from its inception through the 31st of December 1933, but he did not live to see its publication. Russell Hawkins died of a heart attack in his Washington, D.C., hotel room on January 16th, 1934, at the age of 63. Chairman Fahey of the Board was quoted in the New York Times describing Russell Hawkins death as “a severe personal shock”, and he praised Hawkins highly for his service. Psi Upsilon, Russell Hawkins’s University of Pennsylvania fraternity, published a glowing tribute to him in it’s Diamond publication of June, 1934. Russell’s story is one of great success despite adversity and is a perfect inspiration with which to begin the new year. Although I’ve learned so much about him, my research is still is incomplete. I intend this year to visit the Library of Congress to learn more about the functions of the Federal Home Loan Bank Board. Also, I understand that the American Building Association published a lengthy obituary in Volume 54 of its news publication, which may contain further details of his life. I understand that the University of Pennsylvania Library holds a copy of this publication in one of its off-site facilities. One thing I’d like to know more about, which I’m unlikely to find in any trade journal, is Russel’s relationship with his family, especially his mother, Elizabeth, who did not share in his wealth, and who relied on her pension until the end of her days. I’d like to know more about whether Russell kept contact with any of his cousins, including my grandmother’s grandfather, William P. Harrison, Jr., who worked in Kensington, loading cargo onto trains for the Pennsylvania Railroad. I’m proud to have Russell in my family tree, and I’d love to know more about his place there. • Russell Hawkins Letter: the author, from original on file at the National Archives, Washington, D.C.
• Dennis Hawkins’s Civil War pension file, National Archives, Washington, D.C.